Food, Inc. is a documentary released in 2008. 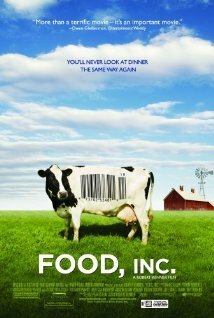 Last night, I finally got around to watching Food, Inc. I have been tempted to hit ‘play’ nearly every time I have logged on to Netflix the past few months (which is actually not that many times thanks to my crazy college schedule). Finally, at the beginning of my winter break and still recovering from finals/the nasty cold that’s kept me in bed for a week, I decided to watch this documentary. I grew excited the moment I saw the name Michael Pollan flash across the bottom of the screen — he’s one of my favorite foodie folks. I discovered him while transcribing an interview for “Food Fight: Feminists and Femivores,” a piece published by In These Times in June 2013. Food, Inc. (2008) is a few years older than this article, and has been mentioned in conversations, articles and books that explore the health food trend among white middle-class Americans — including Emily Matchar’s “Is Michael Pollan a Sexist Pig?”, which is mentioned in the In These Times piece. The film achieved a few things: it made me afraid to set foot in a supermarket or fast food restaurant ever again; it showed a rather comprehensive picture of the industrial world of American food and farming; and it reminded me how frequently the public has no idea how most food in the U.S. is produced. It also showed the financial struggles — those of the farmers, beholden to the major corporations, and those of the people shopping for the cheapest deals at supermarkets and fast food establishments. Now that much of our food is engineered, according to Pollan, our bodies are hardwired to desire three things: salt, fat, and sugar. But talk to any white middle-class 20something or 30something and those are three things we’re taught to fear (at least, that’s been my experience attending a pricey private college in New York State). There is a portion of today’s American society that knows full well not to touch the cookies, canned cranberry sauce, and other ‘conventional’ temptations. Personally, I try to limit my grocery shopping to the farmers’ market and a nearby co-op; I eat local, organic foods whenever possible. I grew up taking dance classes, and whenever I can work it into my hectic schedule, I attend yoga classes at a studio in town. Whenever I have a spare moment, I peruse a close friend’s food blog and carry my Whole Foods reusable shopping bag to pick up groceries. However, I am deeply intrigued by this recent cultural obsession with health, and how it’s so often contained to young, wealthy white women. Matchar’s Salon piece is a fascinating look at feminism and the kitchen, and she makes the notable point that problematic eating habits and processed food entered the “normal” sphere in the U.S. far before feminism — hence her swipe at Pollan with the headline, since he’s been quoted as partly blaming feminism for the families of today eating poorly. Before I go any further, I should note that I am a rather vocal feminist with one too many horror stories from the kitchen. However, my investment in healthful eating and interest in the health food movement have motivated me to believe strongly that both men and women should understand how to cook healthful meals for themselves and their families. That means women are in part responsible for how they and their families eat. Unfortunately, this belief is often at odds with the financial realities of many Americans, which has led to my interest in how the health food movement so often excludes those with low incomes. I have recently immersed myself in the concept of food justice and explored some of the activism that accompanies it. Part of my interest came from my work on a capstone class project called Just Ithaca, for which I wrote about holiday season food-related charity; part of my interest came from exposure to a program created by my local co-op of choice, GreenStar (about which I have also written). My more recent interest in how money fits with my convictions has caused me to carefully consider buzzwords, trends and movements, especially those that seem on the surface to align with what I believe. I have been considering what I want for the health food and food justice movements I’ve observed, and in some instances supported. That’s a movement I’d like to see.